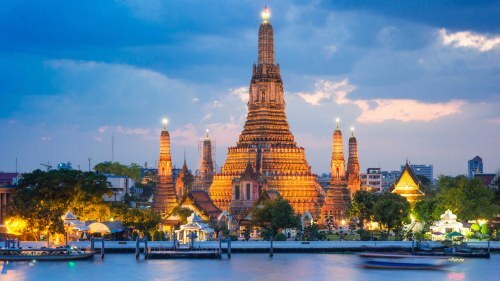 United Airlines and ANA (All Nippon Airways) have dropped the price of their January 2019 flights from Vancouver to Bangkok, Thailand down to between $519 and $532 CAD roundtrip including taxes. For quite a while now, they've been offering flights for this price mainly for travel in May and June 2018. But now they're offering some for January and February 2019 - yes, these flights are nearly a year away from now. You can also find flights from Victoria (YYJ) or Nanaimo (YCD) for a similar price (slightly cheaper actually). NOTE: After your Flighthub search completes, click on 'Flexible Dates' to see more dates. This option is not available on the mobile site. The layover times vary by date. The fastest flights I've seen have a 6 hour layover in Tokyo each way. Some dates have a 23 hour layover in Tokyo on the way home. Also note that on some dates an airport change is required in Tokyo. - For dates, try using start and end dates that are the same as the regular roundtrip flights above. 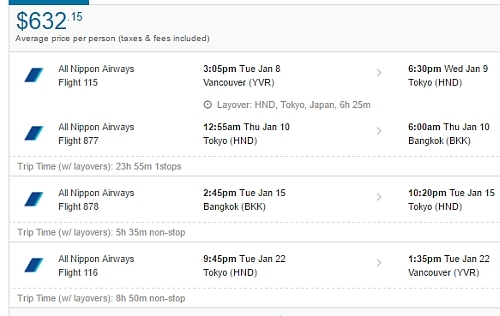 9 Responses to "Vancouver / Victoria to Bangkok, Thailand - $519 to $532 CAD roundtrip including taxes | January 2019 now available"
Thank you Chris! Flights booked! Thanks for this Chris. Booked flights for 2019! So weird doing this as we are literally in the Philippines right now, thanks to the deal you posted about six months ago (similar to this one, with flights from ANA). Booking a vacation, while on vacation. Nice! I booked it! Going to Japan and Thailand in January 2019. Thank you so much. 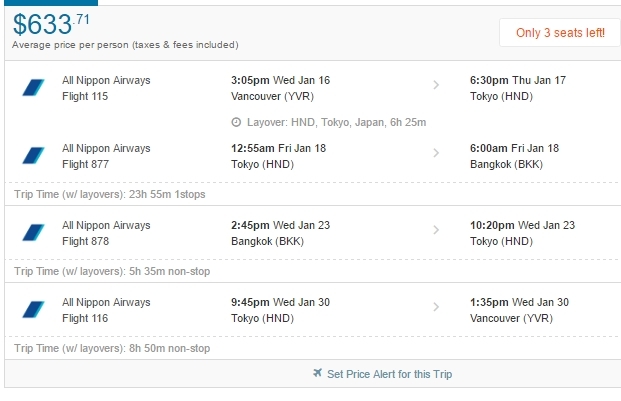 When attempting to book and confirm flight to Bangkok tonight, the price jumped $400 per person, maybe deal is over? Which dates were you trying? It could just be a particular date combination that has sold out. I just tried Jan 14 to Jan 29 and the price verified at $519 roundtrip on GoToGate. 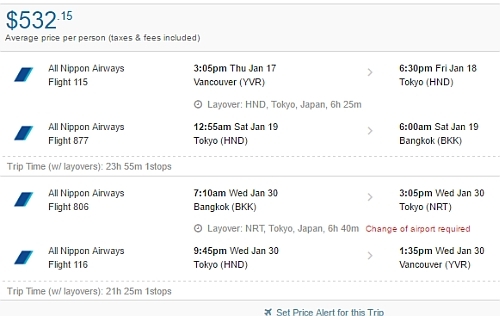 What are some example dates with Tokyo and Bangkok? I can't seem to get any to work?